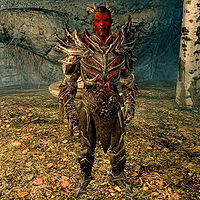 Sanguine wears Daedric armor with matching gauntlets and boots, and carries an iron dagger. He is one of three Daedric Princes to make an appearance in humanoid form. Others are Sheogorath and Nocturnal. Sanguine is a member of the miner class, which determines the level of his skills. Sanguine gives the Sanguine Rose after successfully completing his quest. After completion of quest A Night To Remember, you may find him roaming around Morvunskar, killing every mage he can find. Since he is essential, he will always win. This page was last modified on 1 November 2016, at 18:38.